Kathy E. Turner was born July 24, 1959 in Butler County, Ohio and departed this life Monday, January 14, 2019 at her residence in McKee, being 59 years old. She was the daughter of the late Roy & Gloria (Dean) Sandlin. 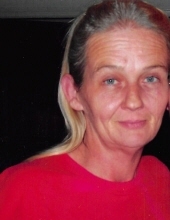 Kathy is survived by four children, Steve Dale Turner of Annville, Billy Sampson of Sand Gap, Bradley Sampson of Lexington and Melissa (Tony) Nedham of Hamilton, OH. She is also survived by two brothers, David Sandlin and Chuck Norris both of Hamilton, OH and by three sisters, Debra Ganz of Utah, Angie Morris of Hamilton, OH and Dawn Lopez of Philadelphia, PA. She was blessed with eight grandchildren. She was proceeded in death by her husband Bobby Dale Turner. "Email Address" would like to share the life celebration of Kathy E. Turner. Click on the "link" to go to share a favorite memory or leave a condolence message for the family.